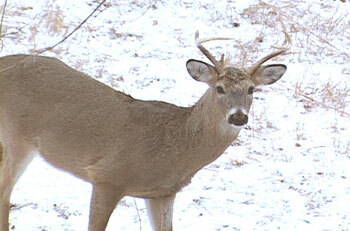 My winter hunt almost ended before it began. My plane had landed in Wichita last evening and I had a three hour drive to the guest house. I rented a Ford Focus and headed West on 54/400. It was snowing and the Focus was slipping all over the road. As I headed South down 183 toward Coldwater, a big doe darted out in front of my car and I lost control of the Ford trying to avoid her. As my car spun sideways then backward at 50mph everything went into slow motion. And right before impact the only thing I thought about was this: "Damn, I should have paid for that supplemental coverage." Luckily, I was able to hold it together, and get the car turned around. For anyone who's ever driven in rural Kansas, my biggest problem was I had no idea if I was now facing South or North. I picked a direction and got back on my way. The doe was fine, and so was that piece of junk Ford Focus. Now I'm glad I declined the insurance. 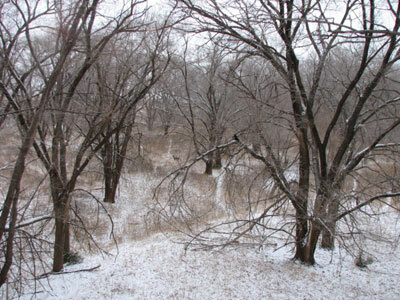 What a difference a month makes...Can you find the deer? 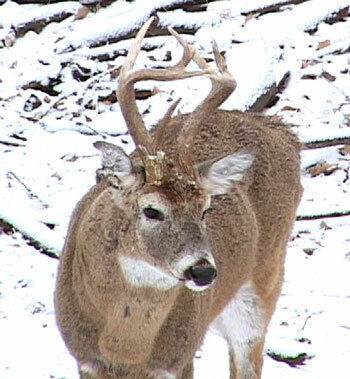 It sure didn't seem that cold when I got into my stand this morning. In fact, I thought I was overdressed. But as it turned light the wind picked up and it was cold with temps in the low twenties and a 10-20 wind. I had 10 deer come by my stand from 7:45-10:15. Two were bucks, but both were small. A spike and a small 8. I almost got a coyote. He had blown the deer out and trotted by me at 20 yards. I made a sound to get him to stop but he ran off instead. Deer were moving all morning long until I got out at 11:00. 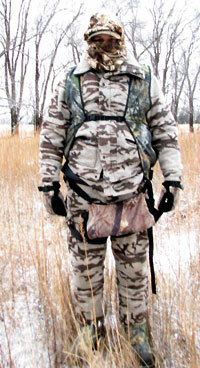 For this morning's hunt I wore the following gear. I was warm, except for my toes. I'd love to see the buck that snapped that main beam off. 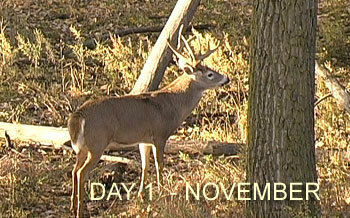 I had deer all around me for 120 minutes including several bucks including my November buck. 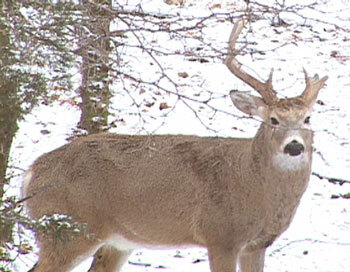 One buck had a doe following him and taunting him into mounting her. But he wanted nothing to do with her. The more she rejected him, the more she would attempt to entice him. 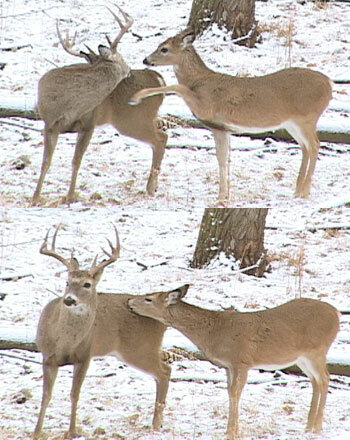 The bucks were showing no rutting behavior at all. They were interested in hanging out together and feeding. 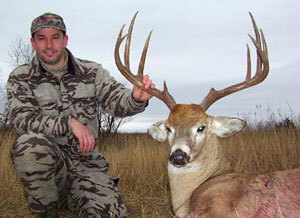 One of the last deer to show up was an extremely old, and heavy "Freak" buck. Nobody had ever seen him before. He was pretty beat up, with knobby knees and scars all over him. I told Kent that I would shoot him later in the week if I hadn't gotten anything by then. He was certainly a novelty, but he only had a season or two left in him - if that. No, it's not Deja-Vu. 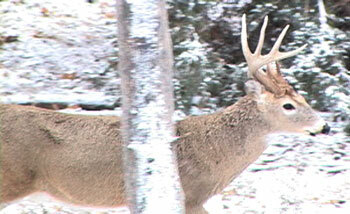 After an incredible November hunt I asked the Kents' if they would be open to a live late December season hunt. I love late winter bowhunting and figured it would be cool (pun intended) to come back to Kansas and experience the post-rifle season bowhunt. 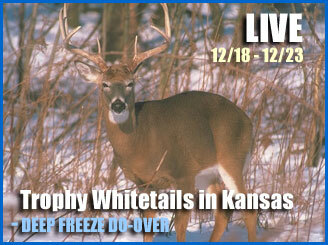 So we decided to bring you a 2nd Live Hunt from Southwest Kansas this year. 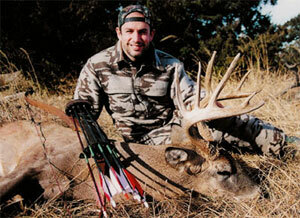 Hunting Gear - 60lb, Bowtech Justice with Beman ICS arrows and a Muzzy 125 head. 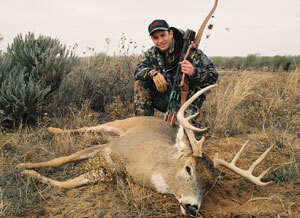 Our Kansas bowhunt takes place in Southwest Kansas with Cimarron River Outfitters.